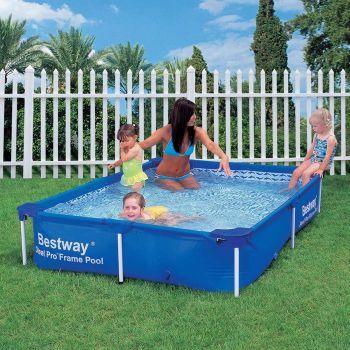 Bestway Steel Pro Rectangular Frame Pool No Pump 90" x 63" x 17"
Rectangular Pools > Bestway Steel Pro Rectangular Frame Pool No Pump 90" x 63" x 17"
- Rust resistant galvanised metal frames. Easy pool construction- no tools required! - Side walls are made with 3 separate layers of material. The inner layer of polyester mesh is laminated to the 2 outer heavy gauge PVC layers. - Convenient drain plug for easy draining- valve attaches to a garden hose so that water can be drained away from the pool area. - The PVC flaps cover the T-connectors and lock pins to prevent rust and injuries. "C" clips hold the T-connector covers in position. - Easy to take down for off-season storage. The 90" x 63" x 17" and the 102" x 71" x 26" pools do not include a filter pump but this is available as an option. Once you have selected your colour option click the select colour button to save your choice.